Everyone loves a good beef curry but often they are difficult to prepare, and they take a long time to make. This version of a Beef Madras takes very little time to prepare, and very little time to cook – but, if you can I’d recommend slow cooking this for as long as you can. You won’t be able to find a Madras curry in India – the variation was invented for British restaurant goers. 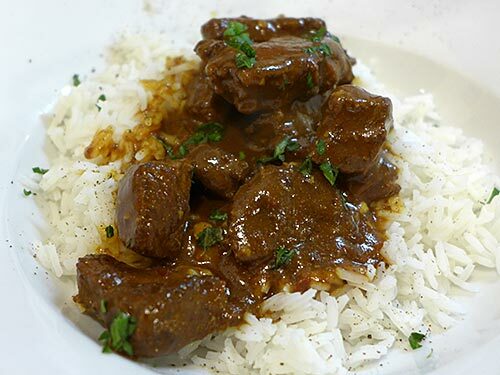 When made with beef or lamb it’s traditionally known as a Gosht – the meat will make the curry a little creamier due to the fat content in the meat. Madras as a city in India no longer exists – it’s now Chennai. Heat oil in a large saucepan over medium-high heat. Cook beef, in batches, for 2 to 3 minutes or until browned. Return to pan. Add garlic, ginger, coriander, cumin, turmeric and chilli. Cook, stirring, for 1 minute or until fragrant. Add tomato paste and stock. Bring to the boil. Reduce heat to low. Simmer, covered, for 30 minutes. Remove cover. Simmer for 30 minutes or until beef is tender and sauce has thickened. Serve with rice and tomato and onion salad. Please note: The sauce did not thicken for me, even after three slow hours of cooking. I ended up adding 2 teaspoons of cornflour, dissolved in water, to the mixture about 40 minutes before serving. I also sprinkled some chopped fresh basil over the dish for serving.